As I mentioned in my previous post, we have decided to acquire a trailer to tow behind our bikes. I bid and won on an article on Trade Me, but the seller took 6 days to respond to my 3 emails, and the response was to ask me to ring him. So I let that one go. Feeling a bit let down, I decided to buy some parts and build my own. I bought a kit of parts (wheels, axles, draw bar and hitch) off Trade Me, which I got in just two working days from the South Island. 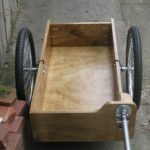 Rather than make a framework and then a box to go in it, I decided to make a robust box which would also be the framework of the trailer. I bought the timber (1200 by 600 by 18mm treated plywood, 2 sheets of) and transferred the trailer design (PDF) to the sheets for cutting. I roughed out the cuts and the finished them off with the router to get those fine edges, before assembly. 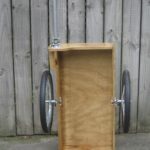 The box is constructed with pocket screws, which neatly hides away most of the connecting hardware, but also makes for a very strong join, especially when teamed with a good amount of exterior PVA glue.The pocket screw holes are filled with plugs to improve the look and weather proof the joints a bit more. It has all been sanded down and coated in an exterior polyurethane varnish. The wheel receivers are pretty simple technology. 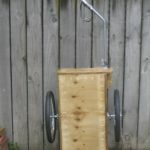 The receiver itself is a short piece (about 55mm cut off a 150mm threaded both end pipe) of 15mm galvanised mild steel pipe which has a threaded end, and a hole drilled crosswise through it to match the hole in the axle the lynch pin goes through. The internal diameter of the pipe (15mm) roughly matches the external diameter of the axle. This is screwed into a flange which is then be bolted onto the trailer body. 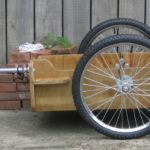 Attaching the wheels in this way, rather than using an axle that goes under the trailer, means the trailer can be much closer to the ground, about 125mm in this case. 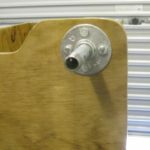 The draw bar attachment is almost identical, but the galvanised pipe is 100mm long, and has two holes drilled in it to match those in the draw bar. The external diameter of the galvanised pipe (21.5mm) matches the internal diameter of the draw bar. 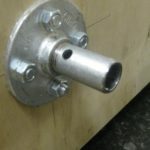 The pipe is screwed into the same type of flange, which is bolted onto the front of the trailer at the appropriate height and distance from the centre line. The circles on the design diagram shows the location of the wheel flanges and the draw bar flange. 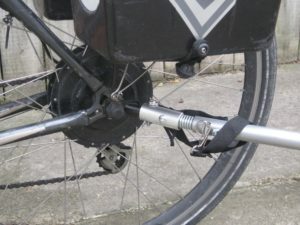 The attachment of the hitch to the bike went on without too much difficulty (could you attach a hitch without a hitch?). The hitch needed drilling out from 10mm to 12mm to fit over the axle. I got a 12mm 1.5 metric nut to fit the axle and to fit into the recession the hitch, and after a slight modification to my pannier rack mounts, it went on fine. Unfortunately the original nut that came with the electric motor wheel was 18mm across the flats, the new one is 19mm, so I have to carry an extra spanner! 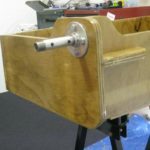 For transport purposes, the drawbar and wheels are simply removed by unclipping a few locking pins. 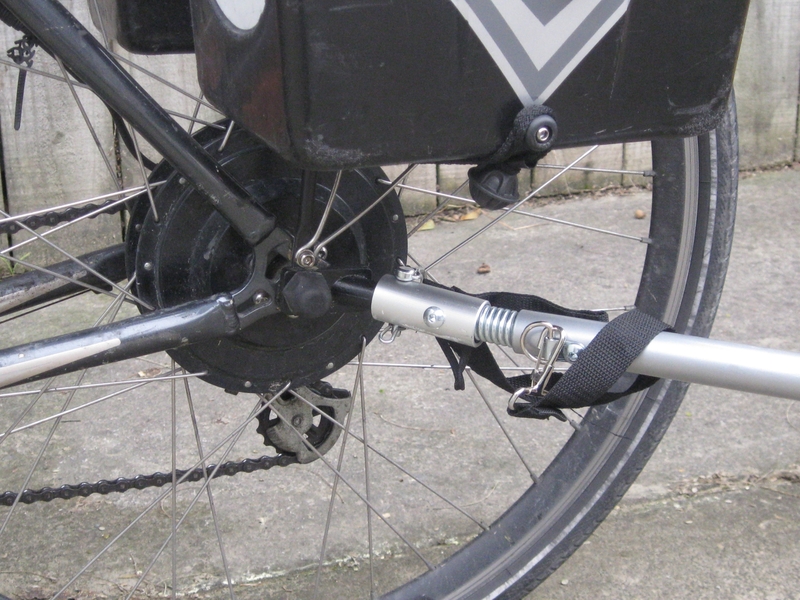 The hitch I am using attaches to the left side of the rear axle, and protrudes a few centimetres. 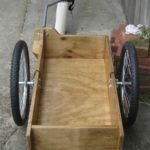 The hitch on the trailer is in two parts, the part which attaches to the bike, and the part which attaches to the drawbar. 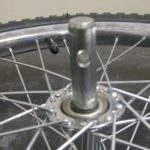 These are joined by a steel spring with a plastic insert, which allows the trailer to follow the bike around corners and over bumps without scrubbing the tyres or straining the hitch. 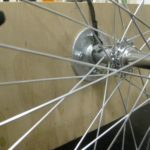 This puts the pivot point for the hitch about 70mm from the rear drop out, which in turn is 70mm from the centre line of the wheel. The drawbar attachment is positioned so that the pivot point is close to the centre line of the trailer. 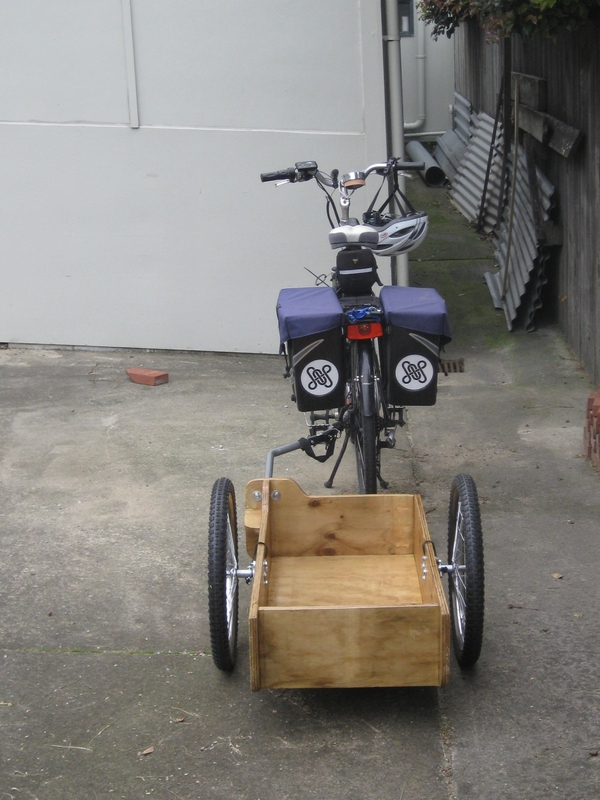 The trailer will now runs straight, but is offset towards the left by 140mm behind the bike.